We’re super excited to share the latest- highly requested!- new feature in Storyline 360: the conditional seekbar. Now you can prevent learners from skipping ahead until they've completed content. After that, they have the option to drag the seekbar back and forth. Great feature. I can definitely use that new feature. Thanks. This is EXACTLY what we need for our training. Unfortunately, I am using SL3, and it doesn't look like it is available for this version. If it is, please let me know! If it isn't, why not? Will it be available in an update in the near future? Seems not very customer-friendly when features are excluded from versions other than 360. I really don't see why it wouldn't be included, unless it's just an attempt to get people to migrate to 360. If so, this one feature definitely does not warrant an upgrade to 360. In fact, this approach is a bit off-putting to be honest. The conditional seekbar isn't a feature in Storyline 3. Articulate 360 is a subscription-based product, and that allows us to roll out updates, new features and fixes on a more regular basis than our perpetual products. I'm sorry it's confusing or off-putting. There are many other features in Articulate 360 and specifically Storyline that may be worth the upgrade to you, so if you'd like to discuss that further our team is always happy to talk through options. You can reach out directly here. If we do add this feature to Storyline 3, we'll let folks know here! Is there a reason this feature isn't available with the Classic player? My corporation currently uses the Classic player as their standard, but this feature would be really nice to use. Hi Kimberly! The conditional seekbar is an exclusive feature of the modern player style, but I appreciate you letting us know you'd like to see it in the classic player, too. We always appreciate feedback from the community! Hope this will apply as well on the Classic player. As I've always use the Classic player more than modern player. I seem to be having trouble with this setting. Attached is my .story file, if anyone can give it a look and let me know where the hiccup is? Modern Player defaults / Controls: seekbar, allow drag after completion, play/pause are all checked. Video options: I set video controls to none, thinking that maybe that was conflicting with the seekbar settings. I also double checked that I have all the updates on my 360 dashboard. Hi Carmin! Thanks for sharing your file! I noticed that the TOC layer opens as soon as the video completes. 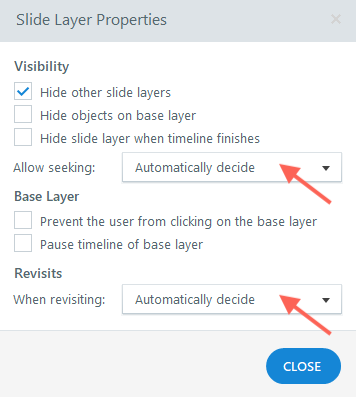 This means that the seekbar could be reflecting the timeline of the slide layer, not the base layer. It sounds like you may want to press the rewind button in the player and have the video start over, is that right? If so, you'll need to adjust your settings a bit. Give those settings a try, and let me know if you see an improvement! Yes that worked, thanks Alyssa! Happy I could help, Carmin! Best of luck on the rest of your project. This is great, big thank you! 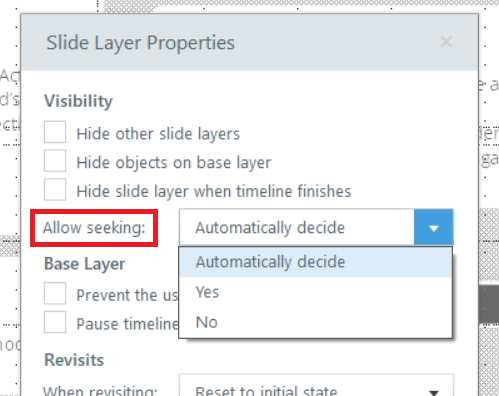 do you have the allow seeking option selected on each slide layer? I worked that after i posted hence i deleted the post, however i am using the conditional seekbar but it’s not working on the layers when i review the individual layer. My slide has custom back button which take the user back to the previous layer - eventually returning the base layer. The seekbar cannot be dragged when re-visiting each layer or the base layer in this instance. Only when I revisit the entire slide are the seekbars on each layer ‘draggable’ . Is your slide revisit property set to 'reset to initial state'? That may be why.. Try setting it to 'automatically decide or resume saved state' and see if that works. 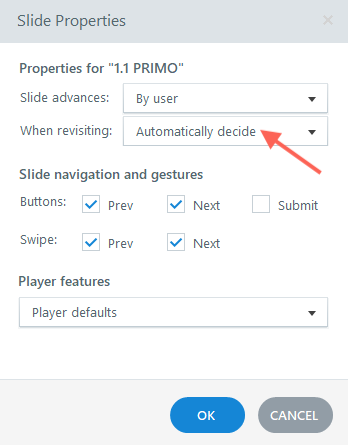 It sounds similar to an issue that Update 21 of Storyline 360 fixed, where the conditional seekbar was only draggable on a revisit to the slide (if you'd also enabled restricted navigation). So first, I'd want to know if you're using restricted navigation in your course and, what update of Storyline 360 you're using? You can check by going to the "Help" Tab -> "About Articulate Storyline". If you're on the latest update, Storyline 360, build 3.23.17480.0, and/or you don't have restricted navigation included we'll want to find out a bit more about your setup. With your permission, I'd like to take a look at your project file to investigate what's happening. You can share it publicly here, or send it to our team privately by uploading it here. We'll delete it when done troubleshooting. 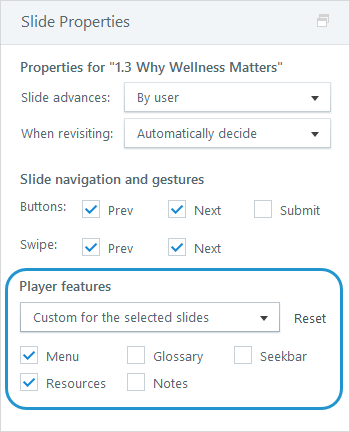 Some of you reported an issue where the next button would be disabled when revisiting slides that advanced automatically in a course with restricted navigation. That button is now enabled in this scenario in update 24 for Storyline 360; check out all the new bug fixes and features here! Here’s how you can update Storyline 360 to see everything this release has to offer. Let us know what you think! is there any option that we can make seekbar restriction for particular slide. i mean i should not drag able to drag the seekbar for particular slides. While there isn't a way to make the seekbar restricted for particular slides, you can hide the seekbar completely on those slides. Simply adjust that setting in Slide Properties. That update for the next button issue is something I have been waiting for since we started using Storyline. Tested it out and worked as promised. That fix in combo with the conditional seekbar and the newer modern player, awesome job to everyone there. I was always confused why it worked in Presenter but not Storyline but I am very happy it was addressed. We create very linear style modules for the most part (long explanation on why we do) and the workarounds I was using to add a unique trigger to each slide make the next button work was very time consuming. Glad to hear you're up and running again, Erik! It was a little bug in Storyline that we had to fix up, so that'd explain the differences you were seeing in Presenter. If you run into anything else, please let us know! Will this feature be added to Storyline 3? "Thanks for your comments and for sharing your opinions, Stacey and ..."
"I have to admit I really don't like this kind of control over navig..."
"Hi Midhun, While there isn't a way to make the seekbar restricted ..."